After several reports of the dampening state of affairs in the global smartphone market scenario, a fresh Canalys report is out with India numbers. Bucking the global trend, the country sees a positive growth of 10 percent in shipments and managed to sell 137.2 million units in 2018, 12 million more than its reported 2017 numbers. Unfazed by global scenario, India now accounts for 10 percent of the world smartphone market share, up from 6 percent five years ago. Xiaomi is a big contributor to these great numbers, managing to take the pole position in India for full year for the first time, by shipping 41 million units in 2018, and raking in 30 percent of the Indian market. Notably, Canalys also found that India became the largest market for Xiaomi globally in Q4 2018. 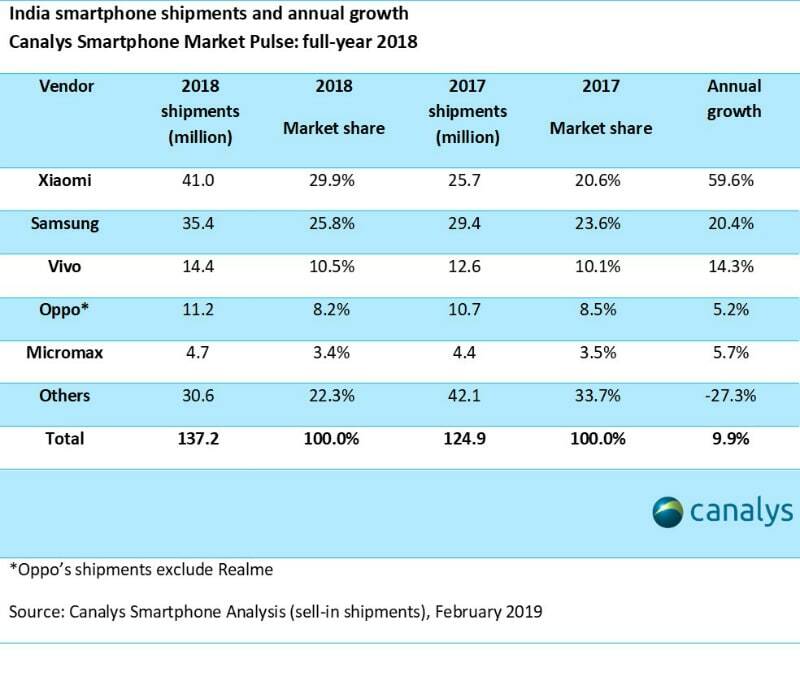 Talking about India’s footprint in the global scene, the Canalys report suggests that the country is one of the six in the top 20 smartphone markets to post positive full-year growth in smartphone shipments. It is said to have outshone Indonesia, Russia, and Italy. Coming to India numbers, Xiaomi was on a roll in 2018 raking in 30 percent of the market share, compared to 20.6 percent in 2017. Its smartphone shipments increased from 25.7 million in 2017 to 41 million last year. Samsung was toppled to the second spot due to the rapid growth of Xiaomi, but the South Korean giant also managed to rake in positive growth in India last year, albeit in a modest fashion. It managed to ship 35.4 million units in 2018 raking in 25.8 percent market share, compared to its 2017 shipment numbers of 29.4 million at 23.6 percent market share. Xiaomi posted an annual growth of almost 60 percent, while Samsung posted a modest growth of 20.4 percent. “2018 was a defining year for smartphones in India,” said Canalys Research Manager Rushabh Doshi. “The impact of a declining Chinese market on vendors such as Oppo, Vivo and Xiaomi was pronounced, with Oppo and Vivo reducing both their above- and below-the-line marketing efforts significantly to counter falls in their Chinese businesses. Xiaomi, on the other hand, focused heavily on India, with excellent results. India is now the biggest market for Xiaomi worldwide. The Chinese vendors have done well to ride the spread of 4G and the boom in local apps and services. 2018 was undoubtedly the year app-based economies flourished.” In Q4 2018, Xiaomi shipped 9.4 million smartphones to China, and 10.0 million to India, the report added. The Canalys report also states that Q4 2018 saw shipments in India growing by 14 percent to 34.1 million units. While Xiaomi, Samsung, Vivo and Oppo remained at the top four, Huawei took a surprise fifth spot by growing its shipments by more than four times since Q4 2017. The report further states that this year is going to be even more successful for the country with OEMs looking to tap into the audience that still relies on feature phones, and put its efforts into boosting offline sales as well.